Incepted in the year 2006, Shreya Ex-tech Pvt. Ltd., is known to be amongst the leading manufacturers, exporters and suppliers of Well Glass Light Fitting, Flameproof Light Fitting, Flameproof Electrical Switchgears and many more. The range’s manufacturing is commenced as per the norms and guidelines of the industry, utilizing the finest raw materials and modern machines. This ensures the product’s performance and longer service life. Further, the offered range, comprising highly demanded products like FLP Light Fitting, Electrical Switchgear and Flameproof Clean Room Light Fitting, is marked at the most reasonable rate possible. We export our products Globally. 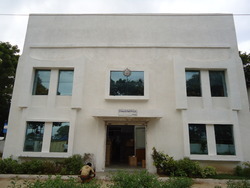 The state-of-the-art infrastructural facility at Shreya Ex-tech Pvt. Ltd., has been parted into several highly operational units, for reasons of attaining smoother and effective management of the firm’s operations. The facility regularly upgraded, helps us in attaining a better position in the market and maximizing our productivity. The infrastructure has been equipped with all the machinery and equipment, which facilitates several of the firm’s predefined targets. Further, our highly ethical working habits have helped us generate a huge client base. Under the supervision of highly skilled and experienced Director, Mr. B. Panigrahi, we have managed to attain greater heights of success, in the past years. His ability to understand the market, analyze changes and managerial skills, have been nothing less than a boon to us. SEPL is committed to be a leading manufacturer of Flameproof & weatherproof Electrical Products, use in hazardous or harsh environment within the process industries, ensuring total safety and protection through Optimum Organizational credible forward presence. We will continue to exceed our customer's increased expectations by providing innovative solution with continuous improvement and commitment towards excellence. Our highly skilled and experienced team of professionals helps us in the attainment of several of the firm’s targets. These professionals, recruited as per their ability to perform and willingness to work hard, help us maximize the firm’s production capacity. In addition to this, to manage the professional’s operations in the most efficient and effective manner, they have been sorted into a number of highly operational units. We are known in the market to be one of the leading manufacturers, exporters and suppliers of this commendable and diverse range of Flameproof Lighting & Switchgear. Thus our manufacturing process involves the using of quality raw materials and modern machines, as per the standards of the industry. This ensures the product’s performance and longer service life. Further, the offered range is known to be marked at the most reasonable rate possible and is delivered punctually. The highly advanced state-of-the-art infrastructural facility at Shreya Ex-tech Pvt. Ltd., has been equipped with all the necessary machinery and equipment, which facilitates the attainment of several of the firm’s predefined goals and targets. The facility, for reasons of managing the firm’s operations in the best possible manner, has been parted into several units. Along with this, to maximize our reach in the market, the facility undergoes regular up-gradation.